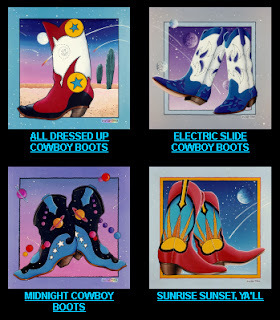 The word "cowboy" comes from the Spanish term "vaquero" - vaca/cow and ranchero/rancher. Cowboys called their saddle horn an "apple"
Most working trail cowboys were between 20 and 25 years old, sometimes learning on the job from age 12. Babe Ruth once ate 12 hot dogs and 8 sodas between games of a double header. Reportedly he was rushed to the hospital after the game with a severe case of indigestion. President Franklin Roosevelt served King George VI of England hot dogs and beer during a White House visit in 1939. Americans will eat enough hot dogs at major league ballparks this year to stretch from RFK Stadium in Washington, D.C. to AT&T Park in San Francisco. "The noblest of all dogs is the hot-dog; it feeds the hand that bites it." ~ Lawrence J. Peter. Celebrate National Ice Cream Month with Pop Art! Posters, Tees & Tops, Cards, Cups, Aprons & Other Gifts! For my series of Pop Art Food I had to include ice cream. One of my earliest memories involves a Dairy Queen cone, my grandfather's lap and my ponytail. Combine these together and you get a soft serve covered pony tail painting the chin of a doting grandfather. 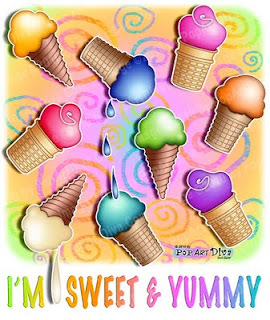 Put a little fun in summer and show off your love of ice cream cones with a fun poster, tee or gift covered in my Pop Art Ice Cream Cones. 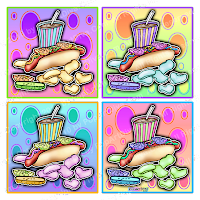 If you prefer something more along the lines of popsicles, check out my POP ART POPSICLES ART & GIFTS!